They may be little, but they pack a big star-forming punch. 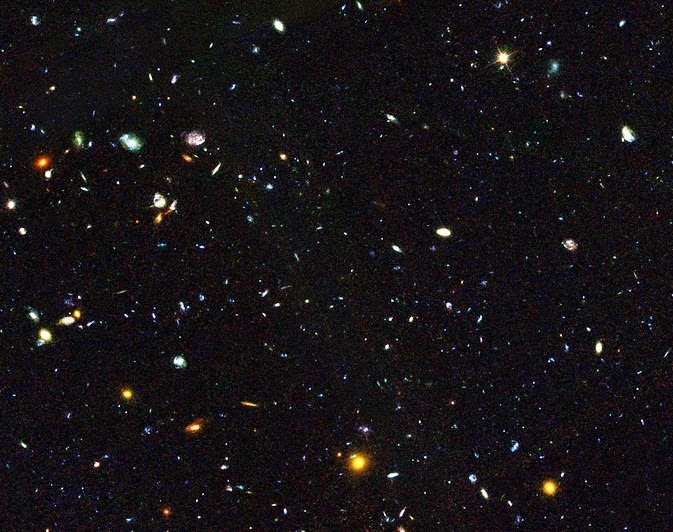 New observations from NASA's Hubble Space Telescope show small galaxies, also known as dwarf galaxies, are responsible for forming a large proportion of the universe's stars. Hiding among these thousands of galaxies are faint dwarf galaxies residing in the early universe, between 2 and 6 billion years after the big bang, an important time period when most of the stars in the universe were formed. Some of these galaxies are undergoing starbursts. Studying this early epoch of the universe's history is critical to fully understanding how these stars formed and how galaxies grew and evolved 3.5 to 6 billion years after the beginning of the universe. The result supports a decade-long investigation into whether there is a link between a galaxy's mass and its star-forming activity, and helps paint a consistent picture of events in the early universe. "These galaxies are forming stars so quickly they could actually double their entire mass of stars in only 150 million years -- an incredibly short astronomical timescale," adds co-author Jean-Paul Kneib, also of EPFL. Researchers say such massive growth would take most “normal” galaxies 1 to 3 billion years. In addition to adding new insight to how and where the stars in our universe formed, this latest finding may also help to unravel the secrets of galactic evolution. Galaxies evolve through a jumble of complex processes. As galaxies merge, they are consumed by newly-formed stars that feed on their combined gases, and exploding stars and supermassive black holes emit galactic material – a process that depletes the mass of a galaxy. It is unusual to find a galaxy in a state of starburst, which suggests to researchers starburst galaxies are the result of an unusual incident in the past, such as a violent merger.